Great place to come with a big group for a birthday - they do an awesome job catering to large parties. Get the truffle pizza, truffle mac and cheese, scallops, or the melt-in-your mouth short ribs. 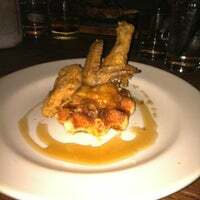 Stuffed French Toast was amazing. Very sweet- really doesn't need syrup. Bottomless mimosas x 2hrs. 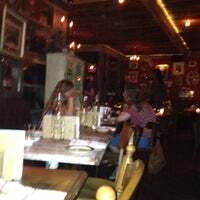 Old, speak easy ambiance (lots of wood) juxtaposed with hip hop music - cant go wrong. a must go! 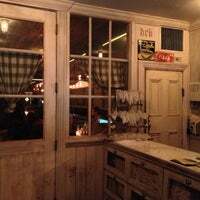 Happy hour gifts $5 beers, and $1 oysters within a venue that seemingly culminates into an early 1900s' motif while embodying the various populations of the LES over the last 150 years. Like your cocktails sweet? The Blackberry Julep is for you! Templeton Rye, blackberries and mint. Dunk the blackberries on arrival for a post cocktail alcoholic sour fruit explosion. OMG the pork belly sliders are to DIE for. Grab them, the truffle pizza and the kale Caesar (you need some green to balance it out) and wash it all down with the grapefruit basil martini. Delish! Get ready for forget-me-not indulgences. Many types of Mac n' Cheese (& Grilled Cheese), but the best are French Onion and the Latin one. TV Dinner is throwback win, fried chicken slides off the bone. This is an awesome spot to post up. Come have some drinks and enjoy the Dj as well. Went on a Friday night fairly early and the crowd wasn't too packed. They were still seating at tables. Awesome. The Lump Crab Melts were insane. Tons of crab. The Wild Pacific Salmon followed up with an herb salad and was equally delicious. Ended meal with churros. 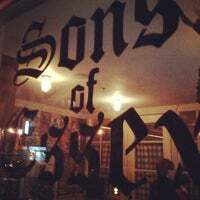 Sons of Liberty cocktail is the way to go! Roll on in for Brunch and get the Steak & Huevos, spiced skirt steak with sunny-side up eggs on a cast-iron heated plate. Careful: HOT! Truffle mac & cheese. Had my birthday dinner here with 5 friends and it was perfect. 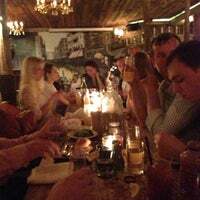 Loved the atmosphere, the food and the drinks. Also good to go and just hang out at the bar. The Carne Asada has the most delicious blend of spices you'll put in your mouth, the pork chop with apples and gram crackers is amazing too. Wash either down with a custom cocktail or a sixpoint. 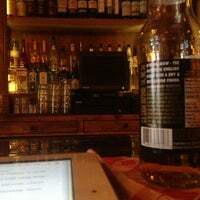 It bothers me when a place has a special at the bar and not if you sit and dine. That said, the food here is tremendous. I loved the cornbread the most but it was all full of great flavors. Fun bar/restaurant with happy hour deals on tasty cocktails like the "Pimm's chalice" or the "Bomb Fizzle" or the "Snoop Dogg." Solid truffle fries and a juicy burger too. All truffle items are amazing the truffle grilled cheese is the best when it's dreary out. Truffle tots in a close second. Love love love this place! Food is always great and staff so nice, my favs are truffle mac n cheese & burger. 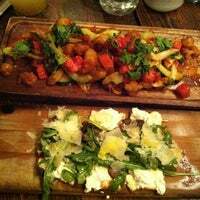 Tried brunch recently, breakfast pizza & truffle tater tots, whoa! I always have a great time here. Impressed with their brunch food. Music is always up beat, tends to have a lot of hip hop. Go with a group and enjoy. Such a good time! The drink and food options are so good. Love the fact that they have a live DJ during weekends playing the latest turn up tunes. The Bowery Mission Makers based cocktail is real good but goes down fast. Grilled mac & cheese sandwich w/tomato soup for dipping? Why has that not been done before? Don't come here on a diet. I usually poo-poo truffle mac-n-cheese, but this was a perfect blend of pasta, cheese and truffle goodness. Of course there's no pict -- ate it already! Latest of-the-moment lounge to swing through for afterhours. Great 90’s throw back music to get you moving, and always a celeb sighting or two! —Tera L.
I have one question...why can't I order a cocktail off the cocktail menu at the bar on a Saturday night out for my friends BDAY celebration but our table can order them from a cocktail server? This place is really cool. 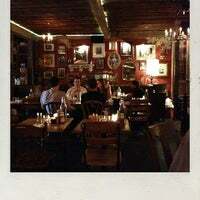 Excellent food; try the fried pickles, truffle mac & cheese, short ribs, and the lobster pot pie. 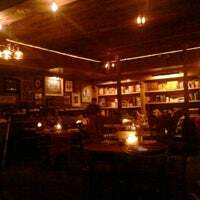 Don't ask for an Irish baby Guinness because if you ask it for it full Harry potter will throw his broom across the bar and spill everything like a 5 year old without his toys! The awesome DJ here favors old school hip-hop & R&B. Get the lobster benedict &/or duck hash for brunch. Great new spot. 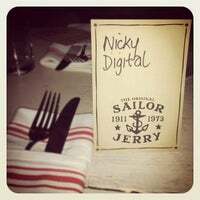 Been here for bday dinners or events. Both scenarios the food blew me away and they know how to make a great drink. I really like this place so far. Great staff. Great hip hop & r&b. Now I just need to try the food. It could be the LES window to my soul. SoE is apparently now more interested maintaining a 'ratio' at night than selling delicious food and drinks. Sad to see it on the decline like this. Obsessed with the dj, the dance floor and the crowd. This place is a full party when you wanna dance like you did in college. Which I do. Every day. 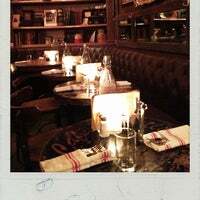 Goat cheese, arugula & truffle oil pizza (amazing) + truffle fries + grilled cheese+ truffle mac & cheese + great service = happy night. 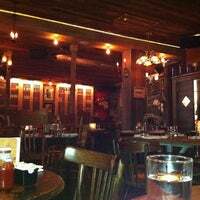 Great for day parties and great food, BUT if it's busy the order may take a while to come out. Brunch pizza. Do it and share. Soft scrambled eggs w/ bacon on flatbread. Weekender perf. Waffle up too. You feel like you entered some alternate dimension. 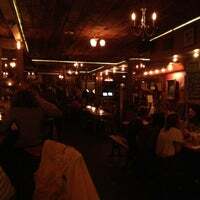 One of the best bars in lower east side. Get the truffle mac n cheese, sinfully good! Chocolate bacon bark is awesome! Great music and totally fun vibe! Bottomless brunch drinks are abut weak but hey it's bottomless. They are excellent with the refills. Benedicto-what? Benedictowitz! Treat yourself for brunch. You're long overdue. Poached eggs on a potato pancake with smoked salmon and hollandaise sounds like the perfect solution. 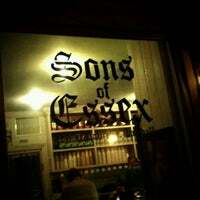 The Sons of Essex menu reflects the diverse melting pot of cultures within the Lower East Side. "Deux ambiances différentes: une salle au rez pour danser et un rooftop." "Wonderful brew options and can easily become a favorite. Trivia offered on Tuesday. Mac and beer cheese was really tasty." 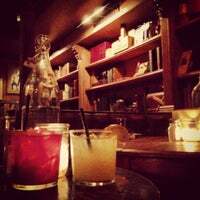 "Grab the jalapeno & cilantro margarita from the top bar, and head downstairs for dancing in the brick walled basement; incredible atmosphere!" "Ditch the lobster Mac 'n cheese; the lobster is absent. 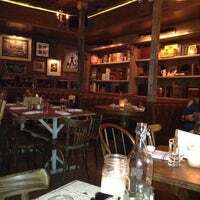 Can't go wrong with the chicken fried oysters, brick pressed chicken, NY pretzel and the PB&J creme brûlée"
"Best place in NYC!!! Allez y le lundi soir pour les cours de swing !! ;)"